A namespace is a scoping container for all messaging components. Multiple queues and topics can reside within a single namespace, and namespaces often serve as application containers. 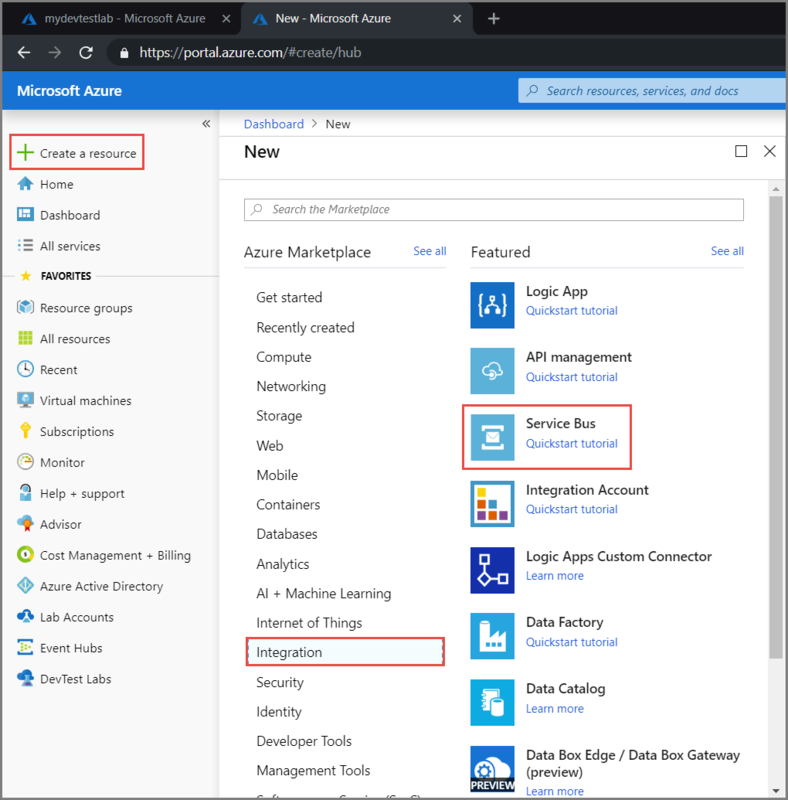 This article provides instructions for creating a namespace in the Azure portal. 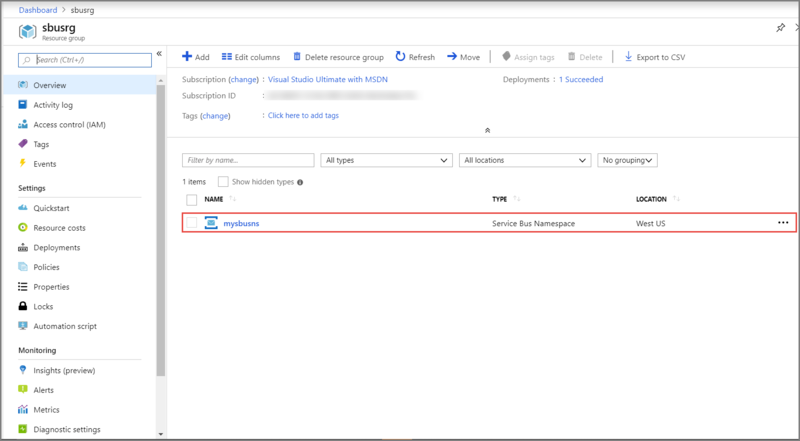 To begin using Service Bus messaging entities in Azure, you must first create a namespace with a name that is unique across Azure. A namespace provides a scoping container for addressing Service Bus resources within your application. In the left navigation pane of the portal, select + Create a resource, select Integration, and then select Service Bus. Enter a name for the namespace. The system immediately checks to see if the name is available. For a list of rules for naming namespaces, see Create Namespace REST API. Select the pricing tier (Basic, Standard, or Premium) for the namespace. If you want to use topics and subscriptions, choose either Standard or Premium. Topics/subscriptions are not supported in the Basic pricing tier. Specify the number of messaging units. The premium tier provides resource isolation at the CPU and memory level so that each workload runs in isolation. This resource container is called a messaging unit. A premium namespace has least one messaging unit. You can select 1, 2, or 4 messaging units for each Service Bus Premium namespace. For more information, see Service Bus Premium Messaging. Specify whether you want to make the namespace zone redundant. The zone redundancy provides enhanced availability by spreading replicas across availability zones within one region at no additional cost. 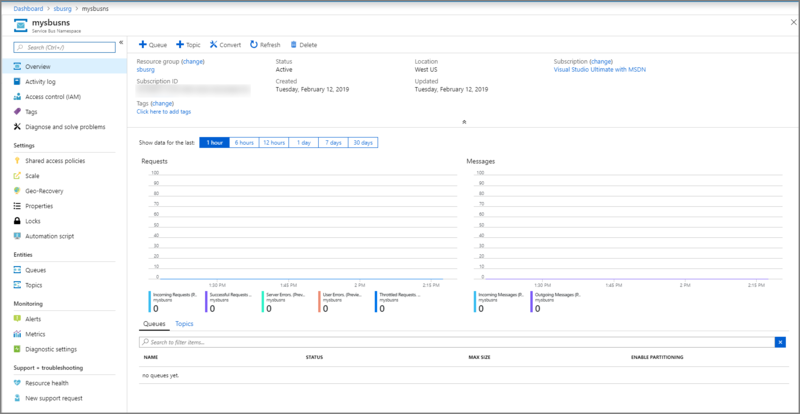 For more information, see Availability zones in Azure. For Subscription, choose an Azure subscription in which to create the namespace. For Resource group, choose an existing resource group in which the namespace will live, or create a new one. For Location, choose the region in which your namespace should be hosted. Select Create. The system now creates your namespace and enables it. You might have to wait several minutes as the system provisions resources for your account. Confirm that the service bus namespace is deployed successfully. To see the notifications, select the bell icon (Alerts) on the toolbar. Select the name of the resource group in the notification as shown in the image. You see the resource group that contains the service bus namespace. 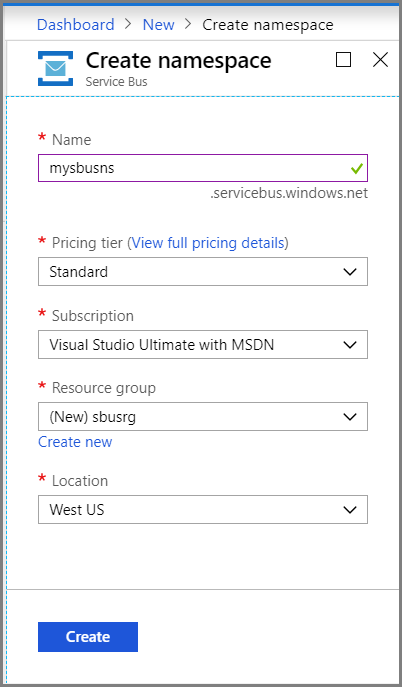 On the Resource group page for your resource group, select your service bus namespace. You see the home page for your service bus namespace. Click All resources, then click the newly created namespace name. In the namespace window, click Shared access policies. 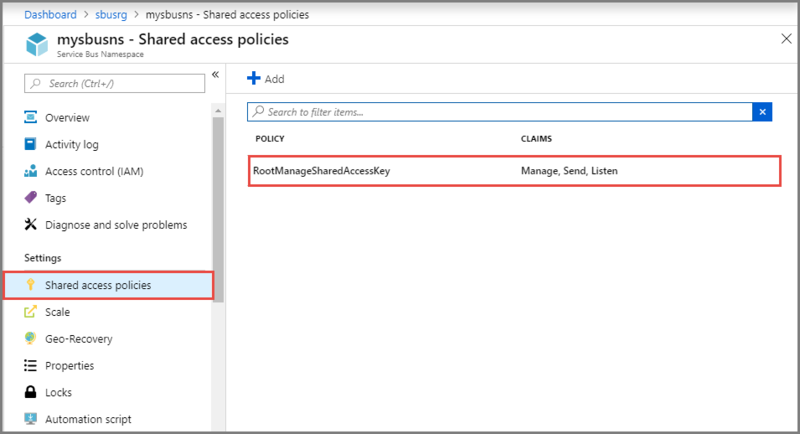 In the Shared access policies screen, click RootManageSharedAccessKey. 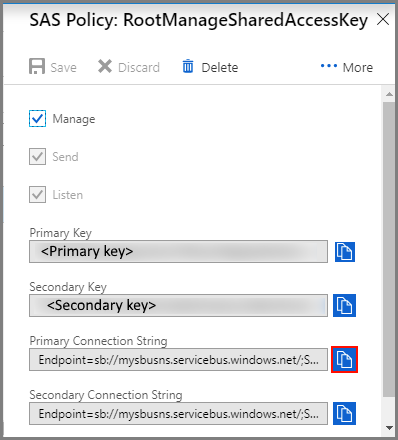 In the Policy: RootManageSharedAccessKey window, click the copy button next to Primary Connection String, to copy the connection string to your clipboard for later use. Paste this value into Notepad or some other temporary location. Repeat the previous step, copying and pasting the value of Primary key to a temporary location for later use. Congratulations! You have now created a Service Bus Messaging namespace. Check out the Service Bus GitHub samples, which show some of the more advanced features of Service Bus messaging.